Follow Route 109 to Westwood. At Westwood Center, take a right on Hartford Street (opposite the Mobil Station). Go to the four-way stop intersection and take another right onto Walpole Street. Follow Walpole Street to traffic light at Dover center. Continue straight onto Springdale Avenue. At "Yield" sign, take a left onto Farm Street. Continue three miles to Junction Street (at Dover-Sherborn Administration Building). Turn right onto Junction Street and turn into driveway to high school 1/8 mile on your right. Follow Route 16 through Wellesley to South Natick. At South Natick center, Eliot Church is on the right at the traffic light. Take a left onto Pleasant Street and go one block on Pleasant Street past Natick Falls, then take a right on Glen Street. Follow Glen Street to the end and take a right on Farm Street. 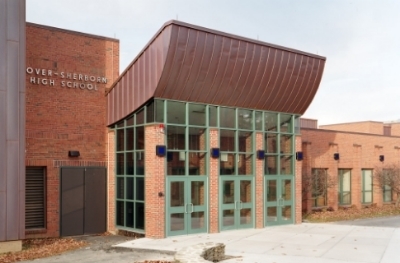 Go one mile to Dover- Sherborn Administration Building, take immediate right onto Junction Street. The driveway to the high school is 1/8 on your right. At center of Medfield take a left on North Street. Go 3/4 mile and bear right at the fork. Go to the next fork and bear left onto Farm Street. Follow this to Junction Street. Turn left onto Junction Street and high school is 1/8 mile on your right. Follow Route 27 to Sherborn line. Go approximately one mile to blinking yellow light. Dowse's Apple Farm is on the left. Take left turn (at corner of Dowse's) onto Lake Street. Follow Lake Street through one stop sign (Route 16). At second stop sign turn left onto Farm Road and follow to end. At stop sign take a right onto Farm Street and proceed one mile. Immediately after Administration Building bear right onto Junction Street. The high school entrance is 1/8 mile on your right. Take Exit 15 and after paying toll, fork to the left. At the stop sign take a left. There is a sign that says, Route 16- Wellesley. Follow that road until you come to a traffic light at Route 16. Take a right and follow previous directions "Via Route 16" (4.7 miles) to South Natick. Click here to report any broken links or website issues that need to be resolved.